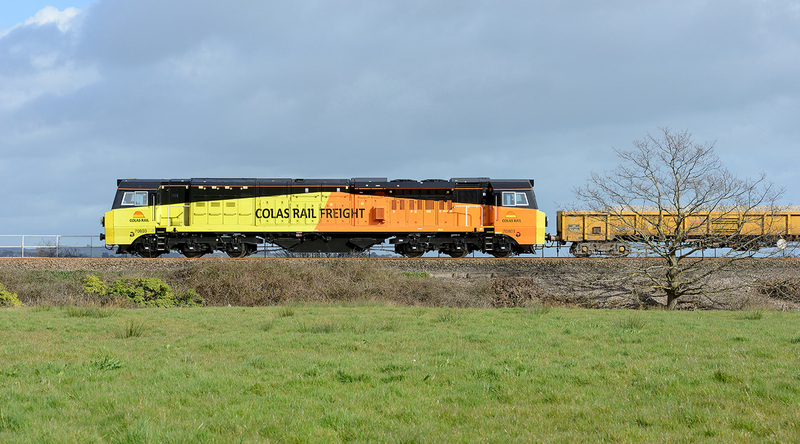 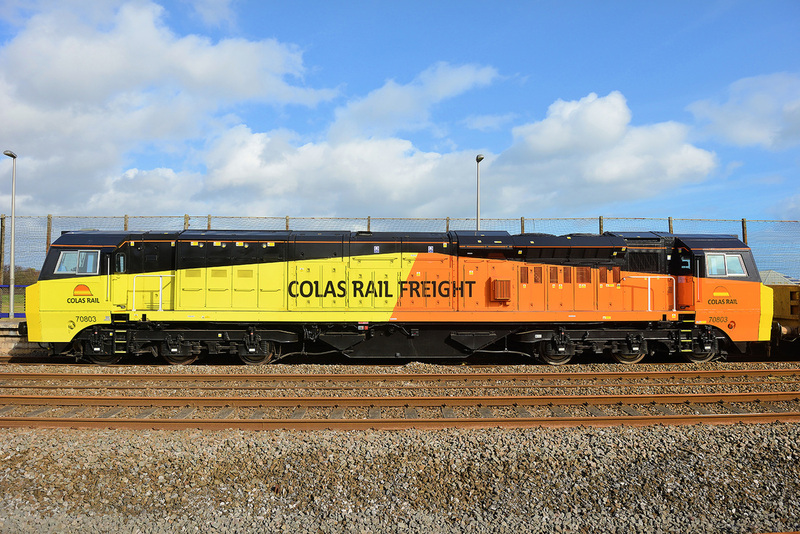 Colas Class 70 No. 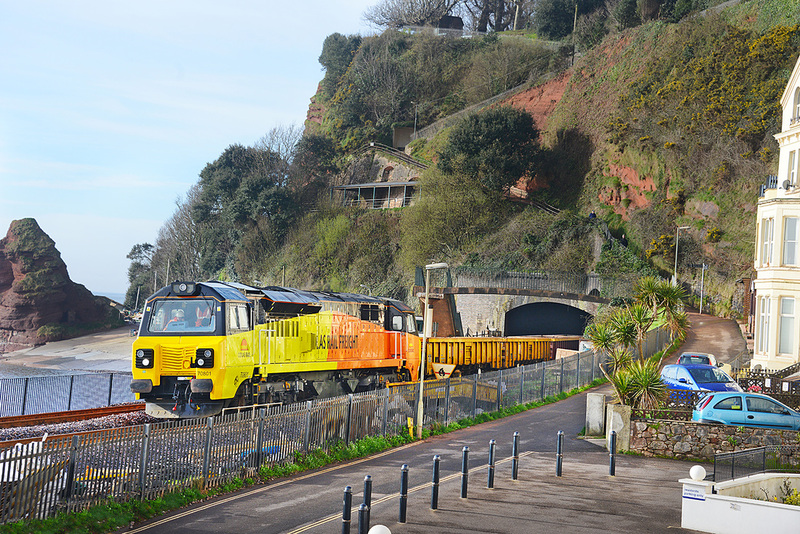 70801 departs from Kennaway Tunnel, Dawlish on 25 April 2014 powering train 6C29, the 13.20 Newton Abbot Hackney Yard to Westbury. 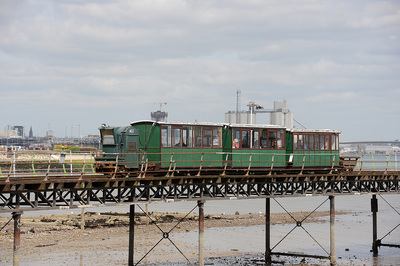 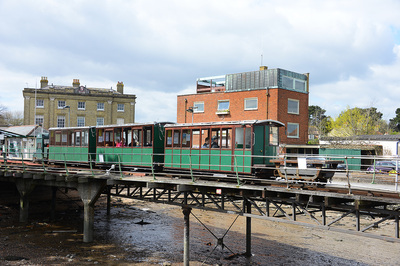 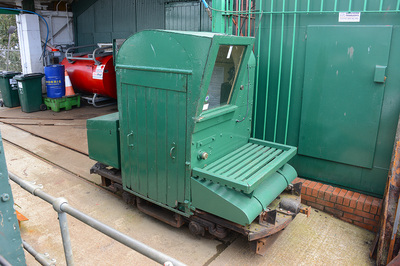 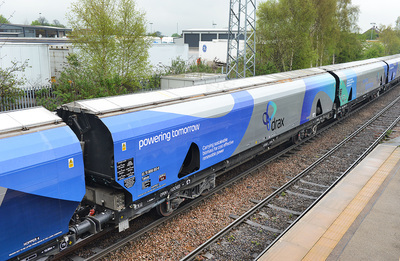 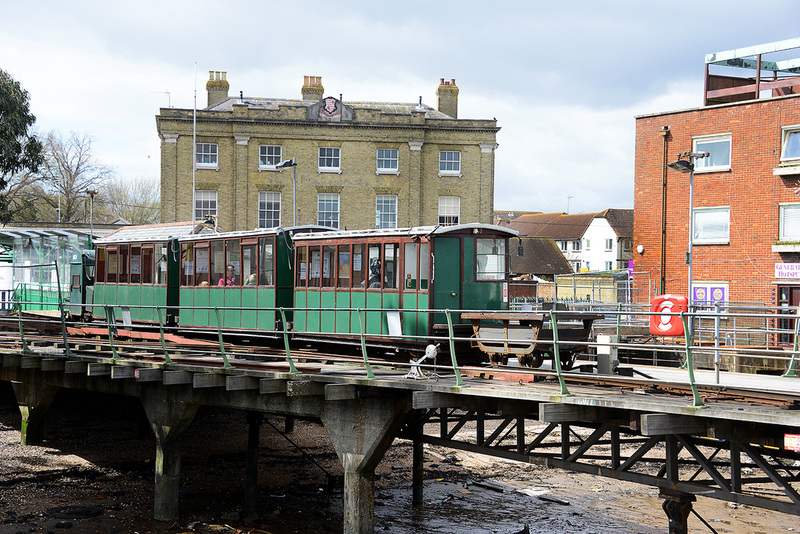 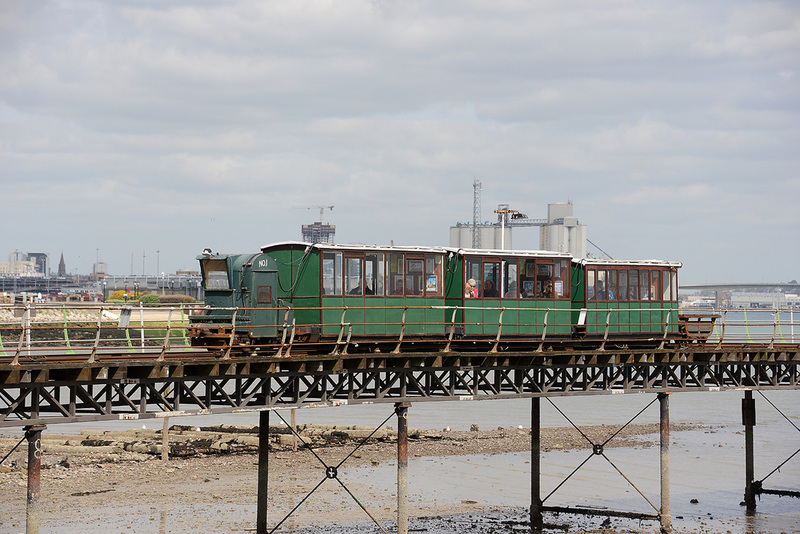 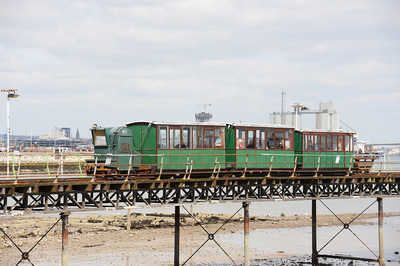 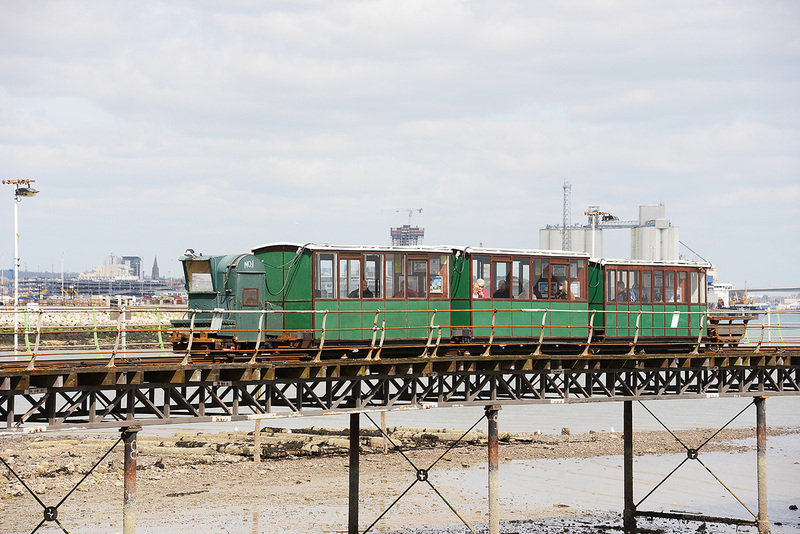 This train was formed of 25 MRA wagons which had been placed in Hackney yard for use in the Whiteball Tunnel project back in January/February 2014 and became trapped in Hackney Yard following the collapse of the Sea Wall. 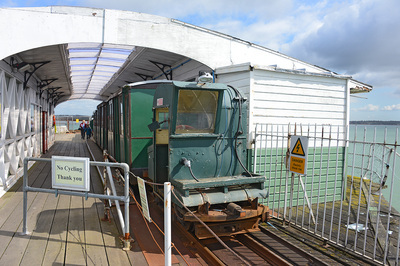 A video of this train can be viewed here. 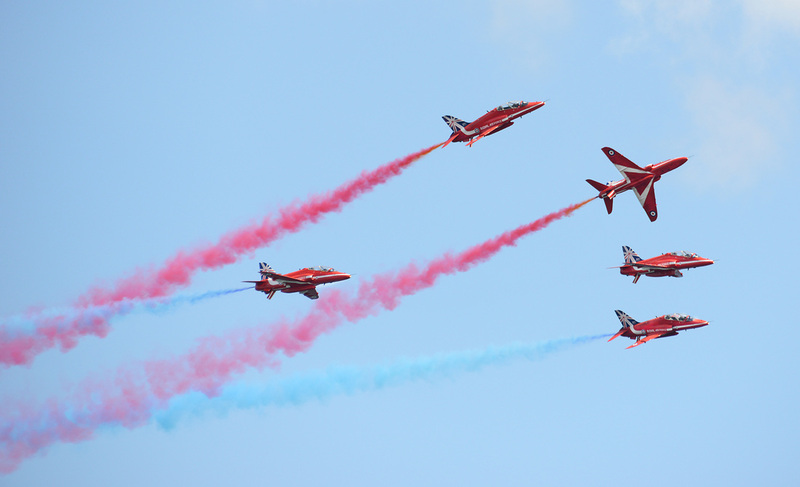 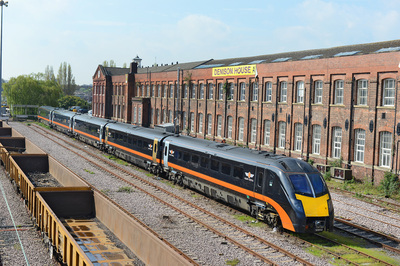 A couple of days visiting Knottingley, Selby, Doncaster, Barnetby and Marholm. 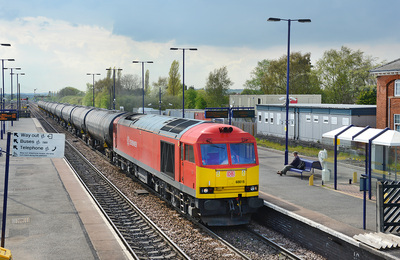 DB-S liveried Class 66 No. 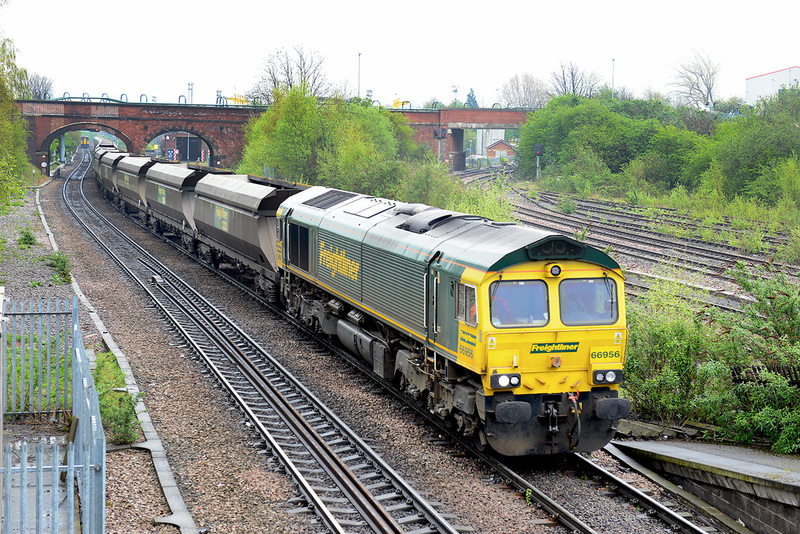 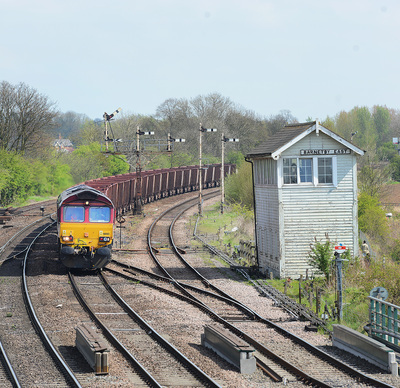 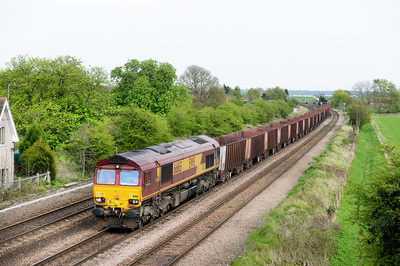 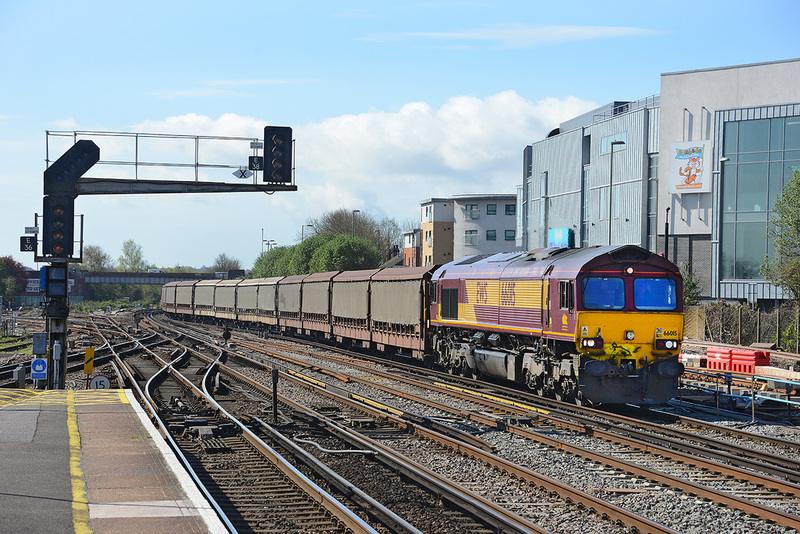 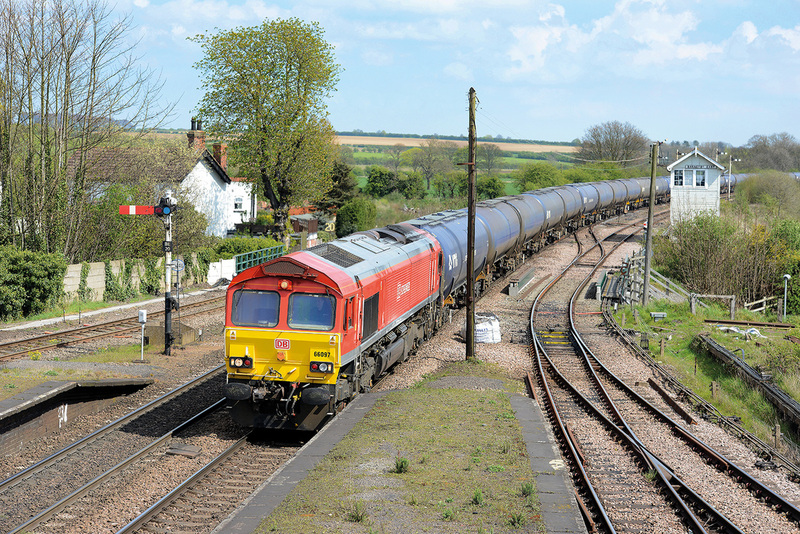 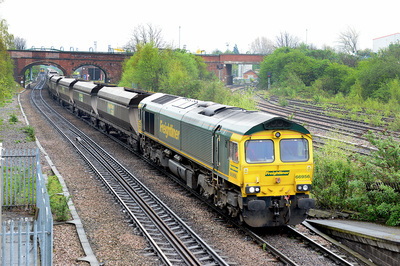 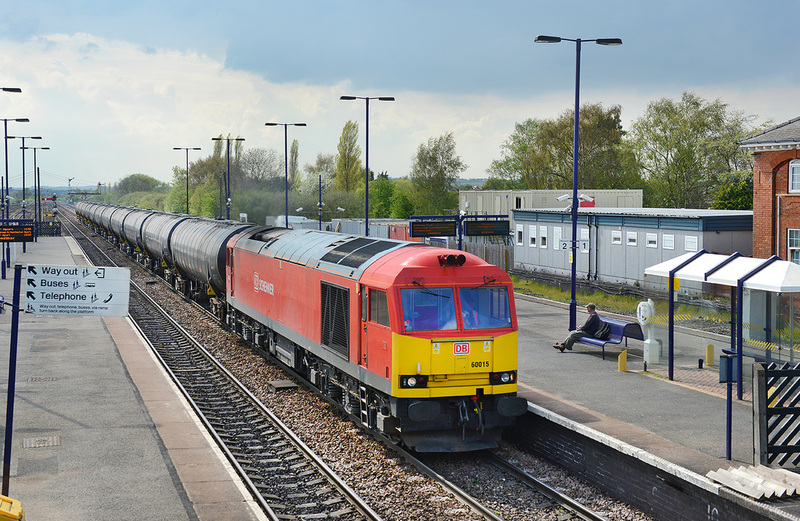 66097 passes Barnetby on 23 April 2014 powering the 11.40 Humber Oil Refinery to Kingsbury loaded oil. 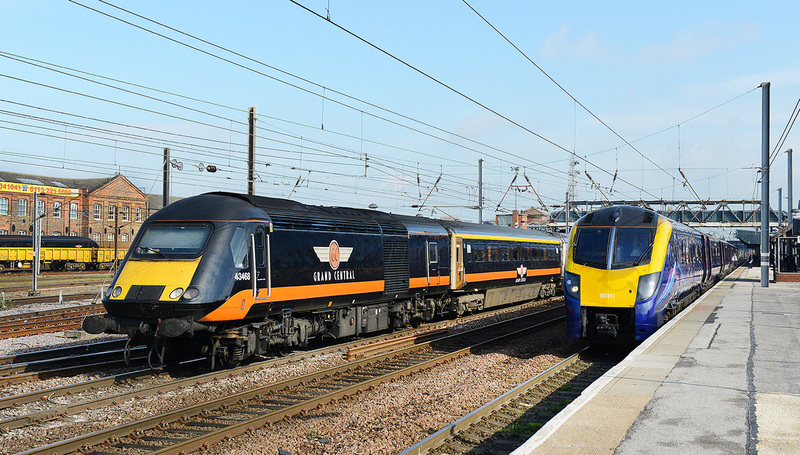 Grand Central HST, led by power car No. 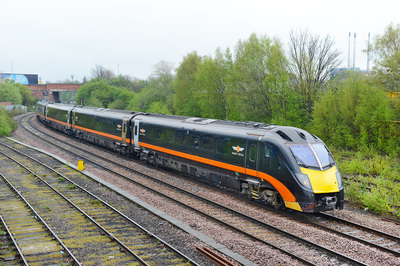 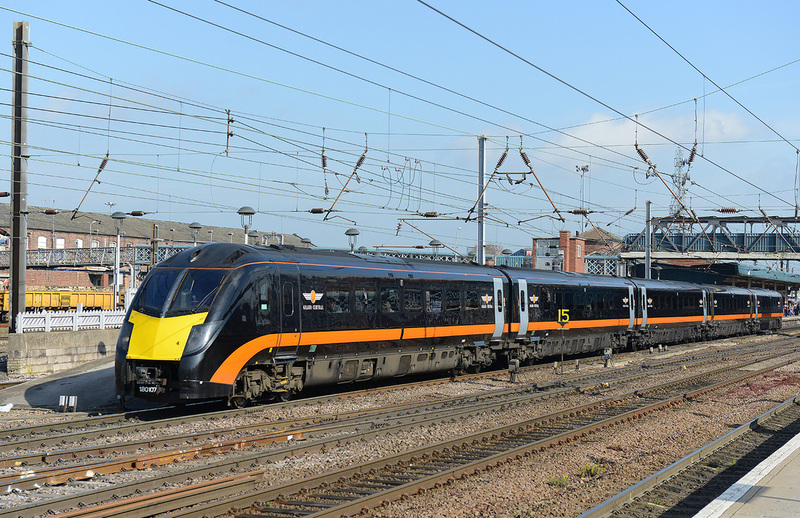 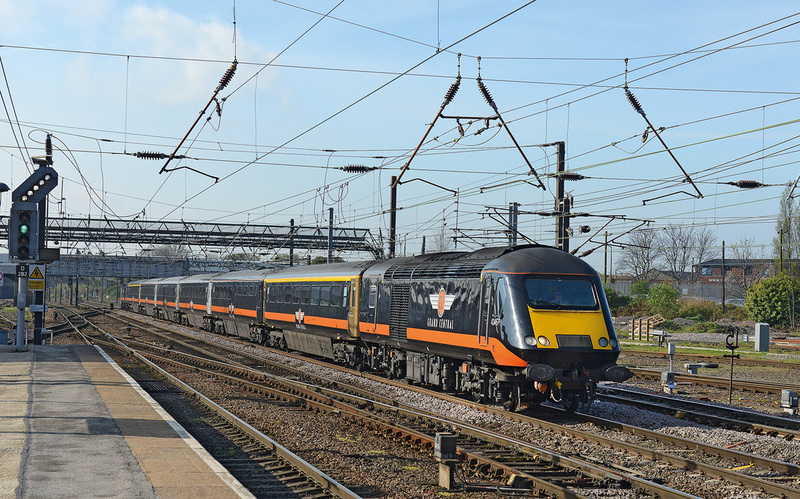 43467 passes Doncaster on 23 April 2014 forming train 1N90, 07.52 King's Cross to Sunderland. 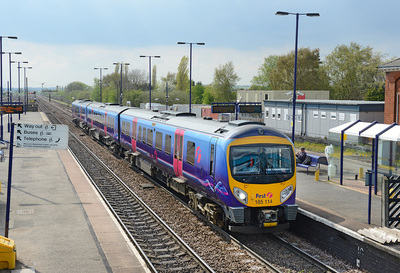 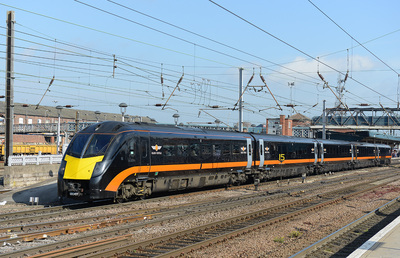 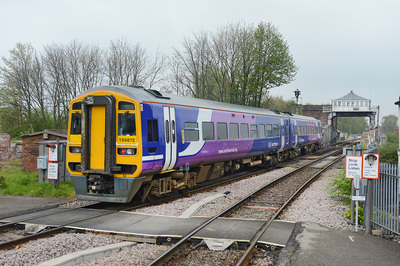 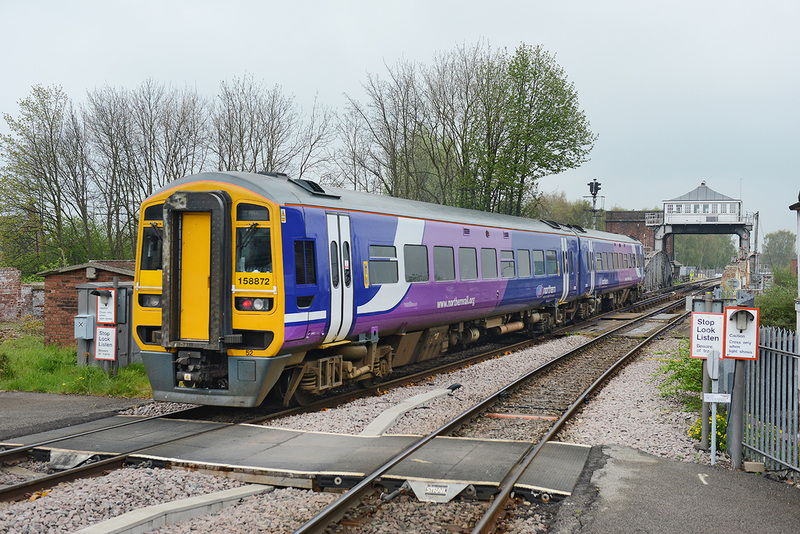 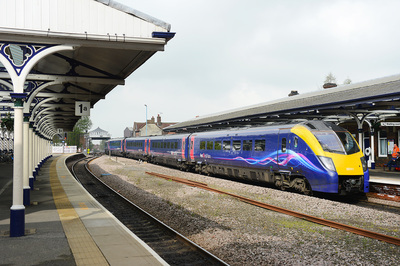 First Hull Trains Class 180 No. 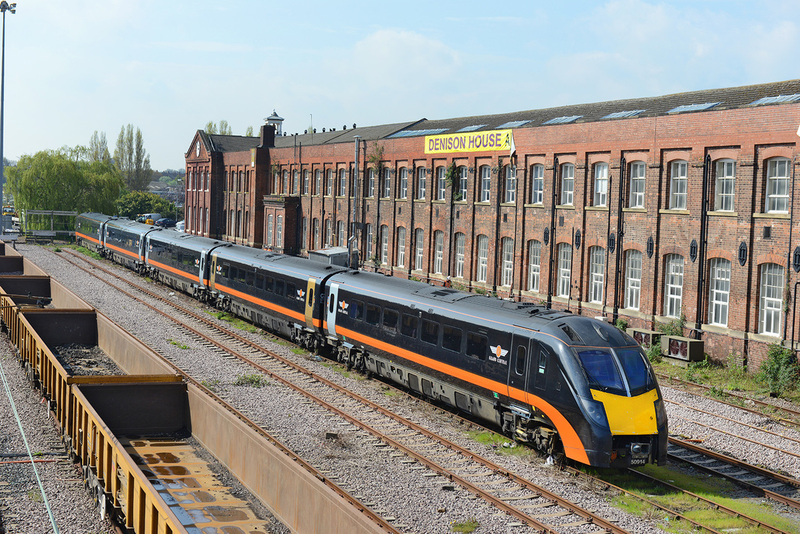 180113 stops at Selby on 22 April 2014 forming train 1H04, 13.48 London King's Cross to Hull. 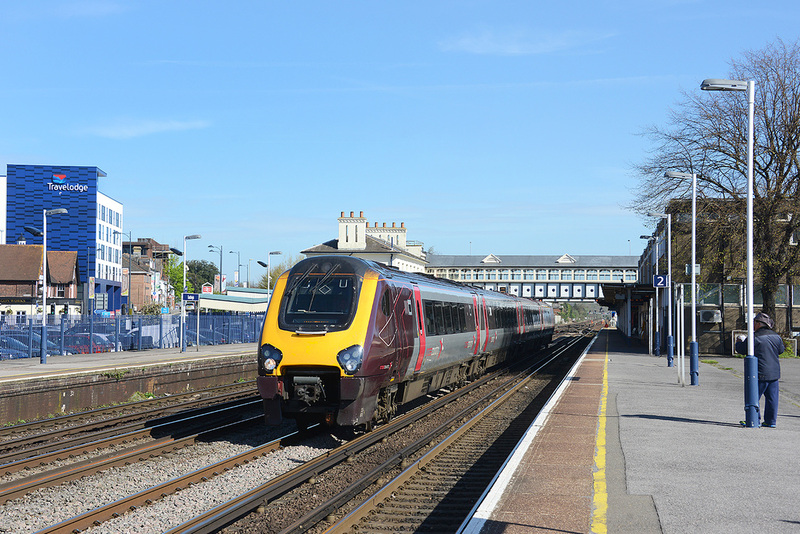 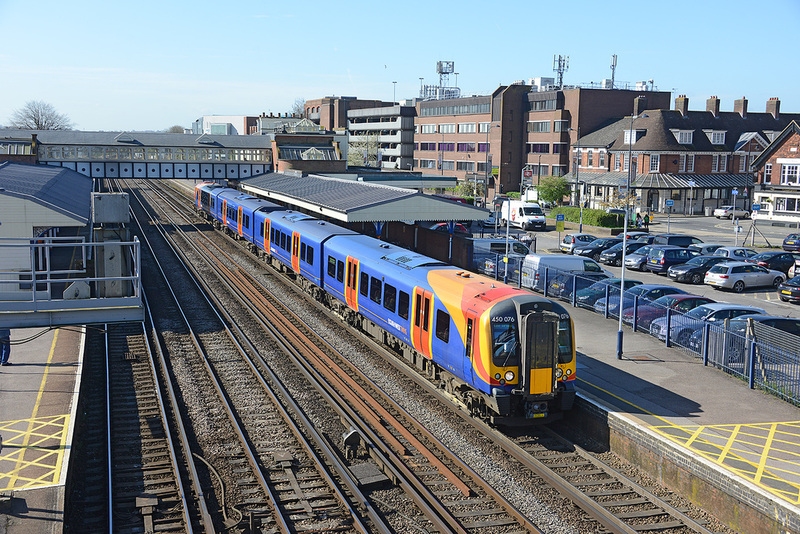 On 21 April 2014 (Easter Monday), South West Trains 158 No. 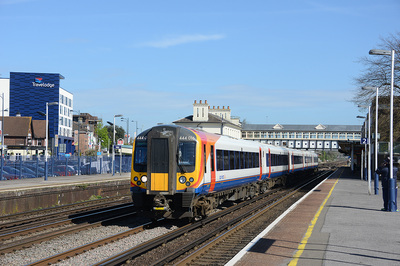 158884 coupled to First Great Western Class 153 No. 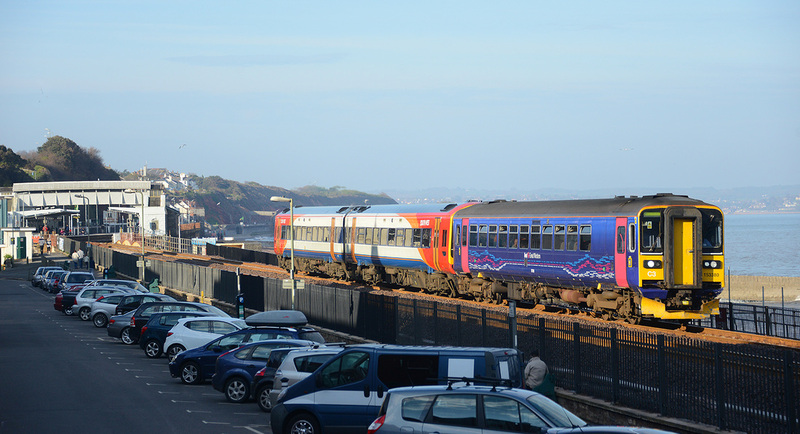 153380 formed train 2T25, the 17.45 Exeter Central to Paignton, seen departing from Dawlish in the pleasing low-evening light. 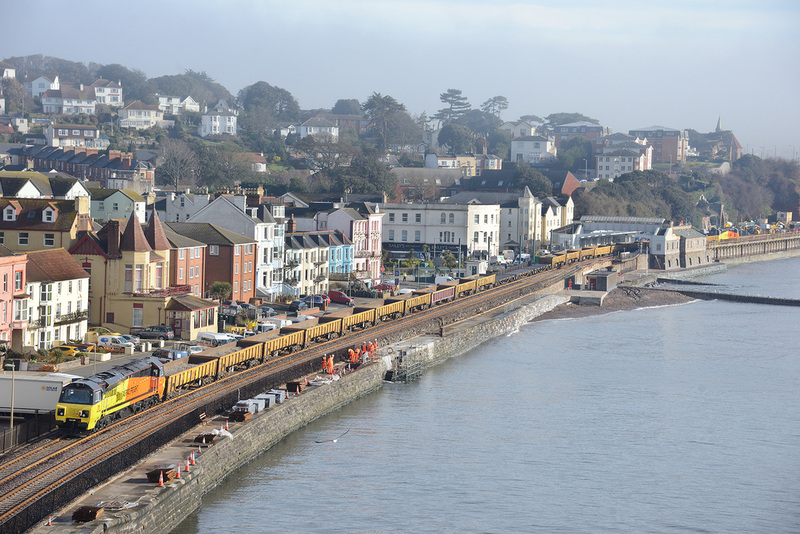 This is reported to only be the 5th time a SWT Class 158/8 has operated along the Sea Wall. 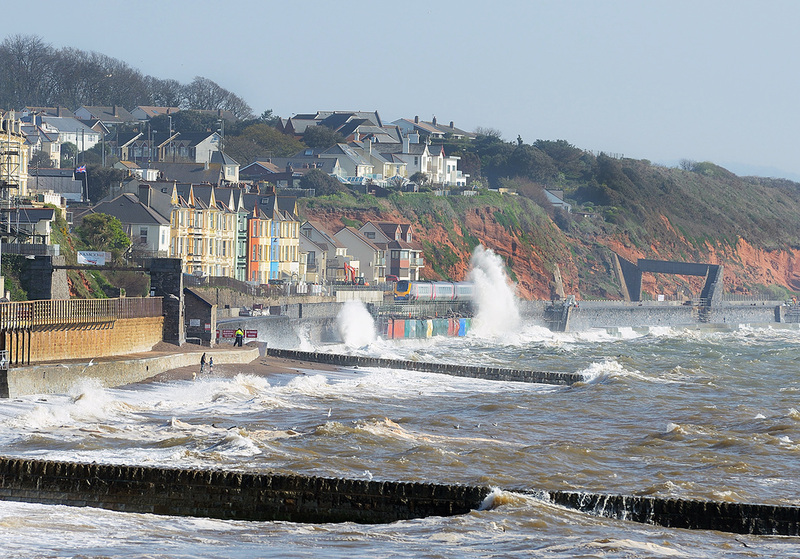 A picture ive been waiting to take since the Dawlish Sea Wall was washed away on the night of 4/5 February 2014. It shows the very first 'train; to traverse the down line, although heading in the up direction, when Freightliner Class 66/5 No. 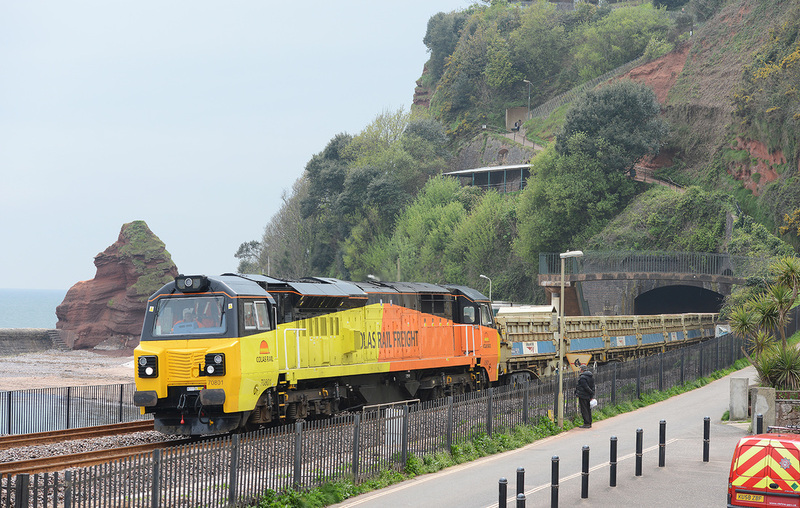 66555 emerges from Kennaway Tunnel at 17.25 on 29 March 2014 leading train 6Y75, a late running 17.03 Exeter St Thomas to Westbury. 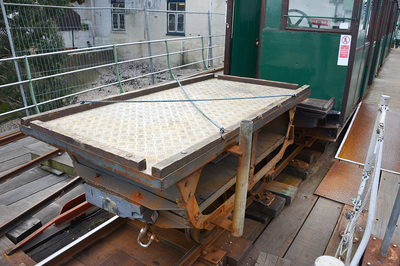 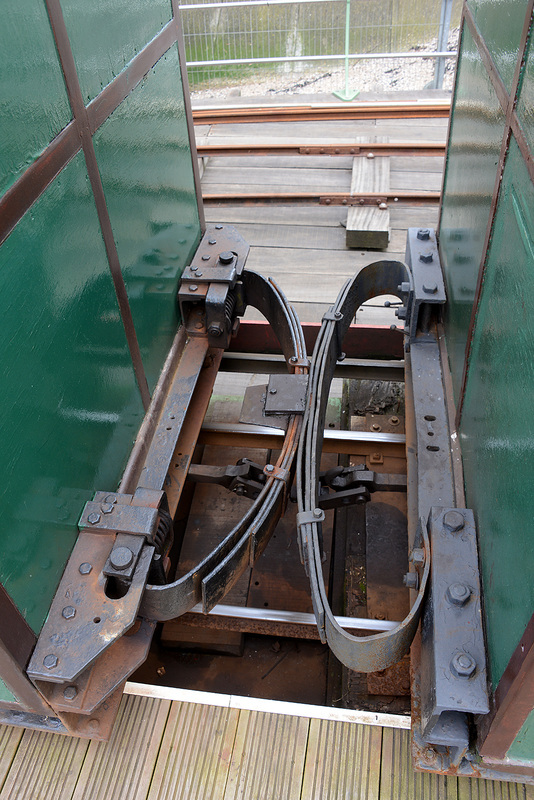 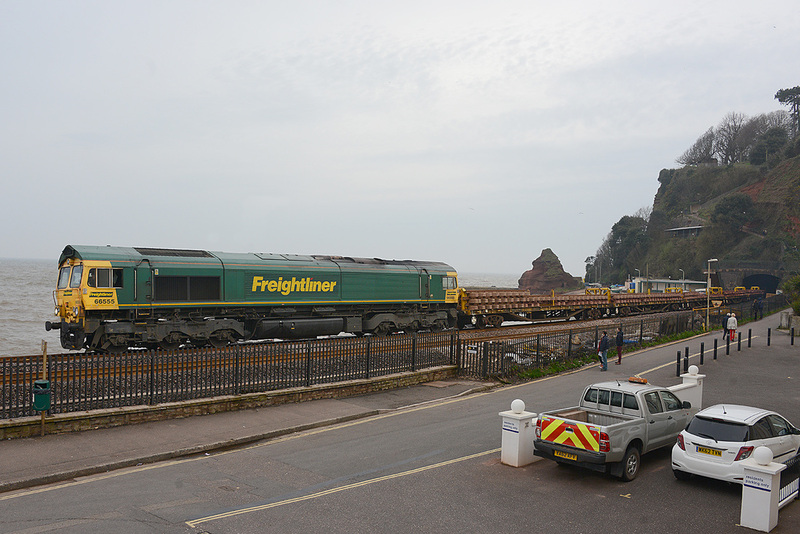 The train was loaded at the cliff slip at Teignmouth and consisted of damaged track sections and spoil. 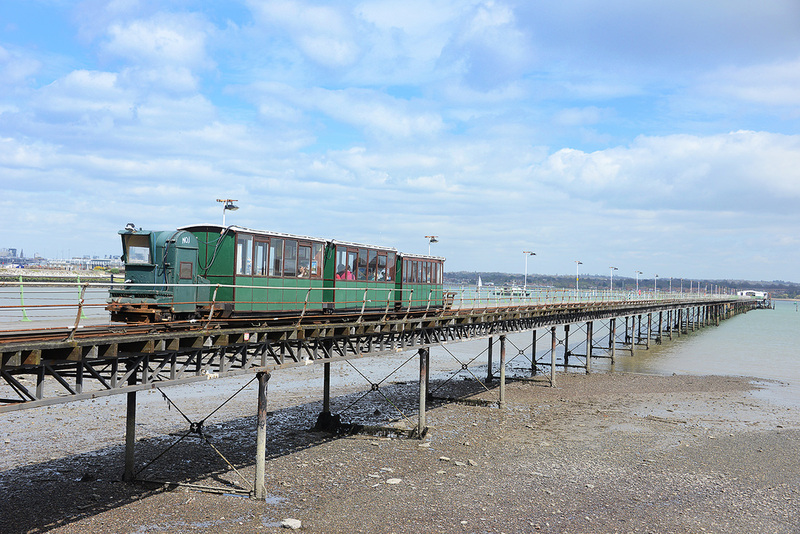 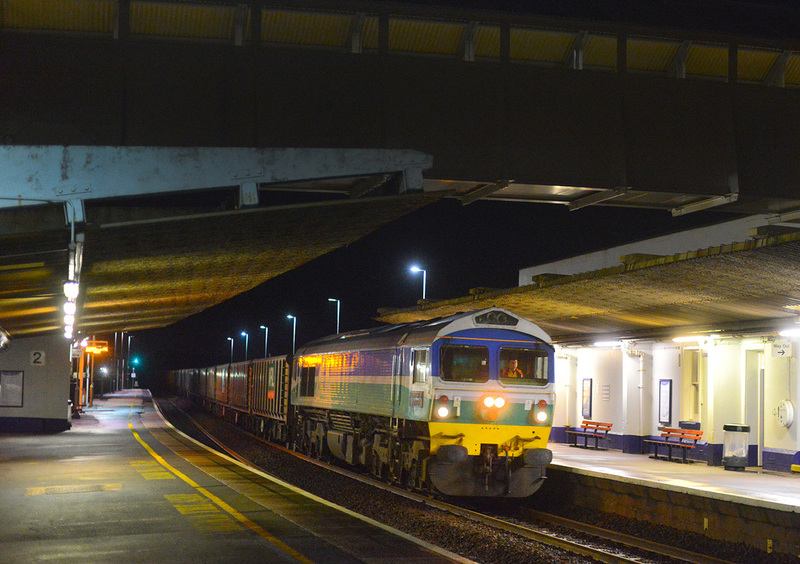 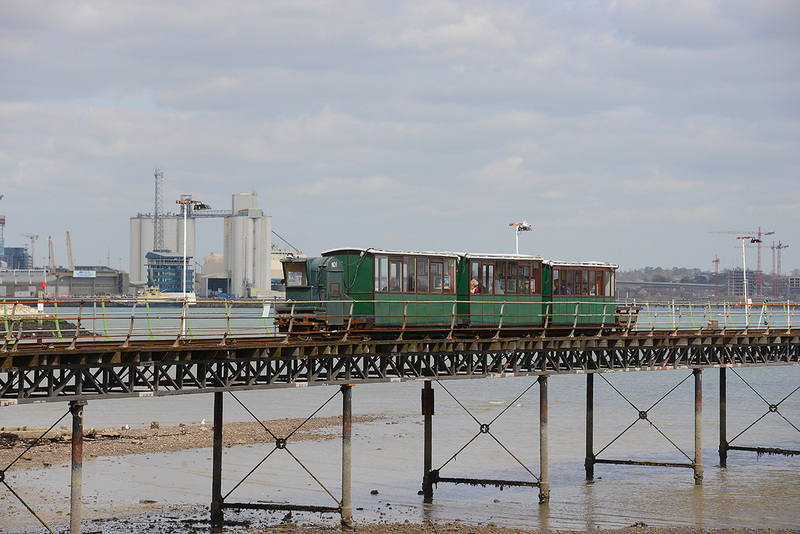 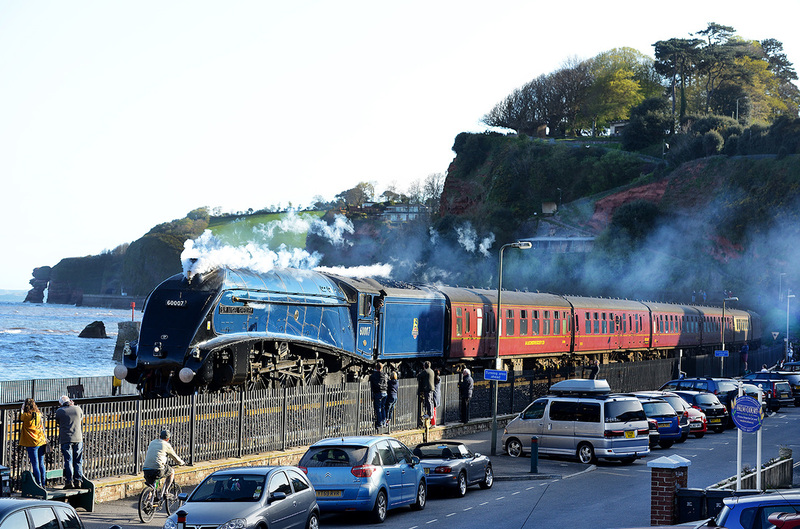 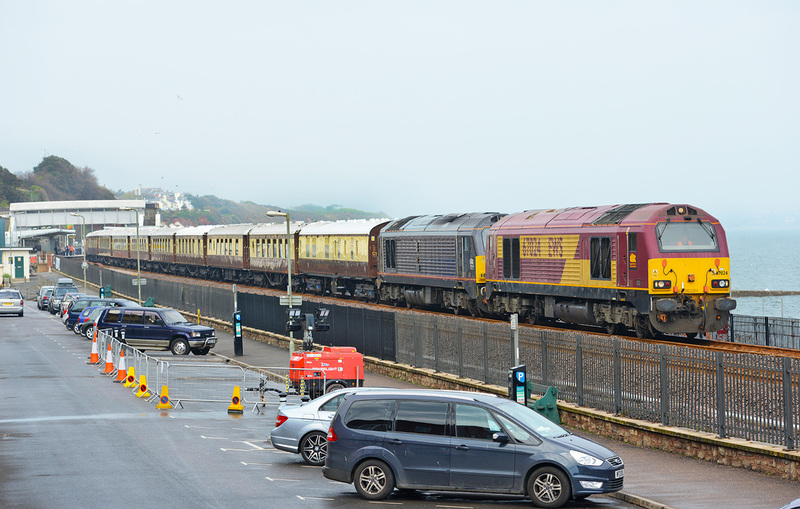 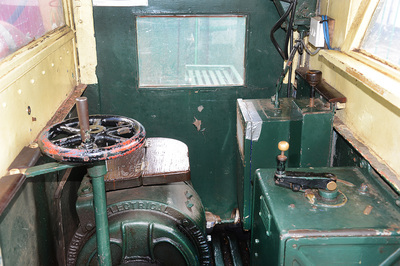 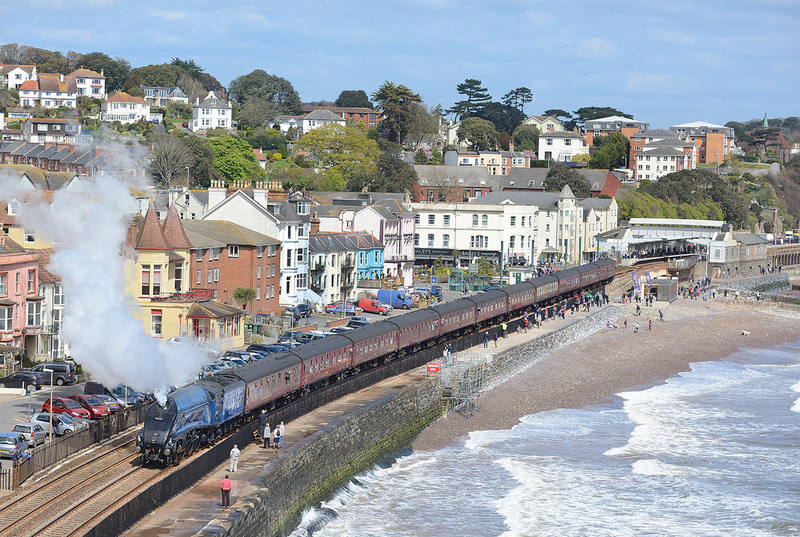 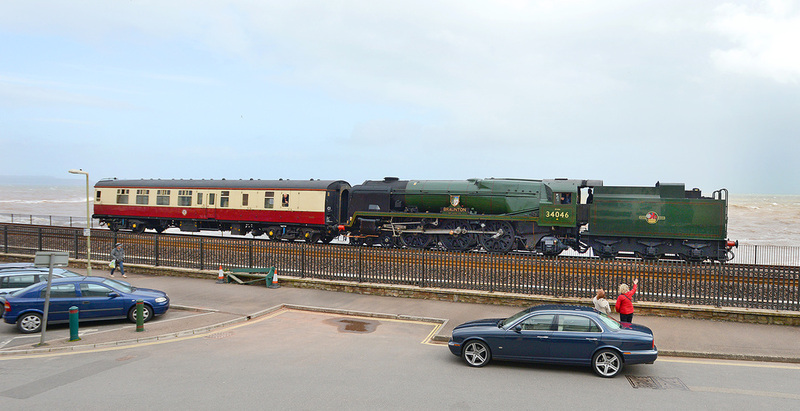 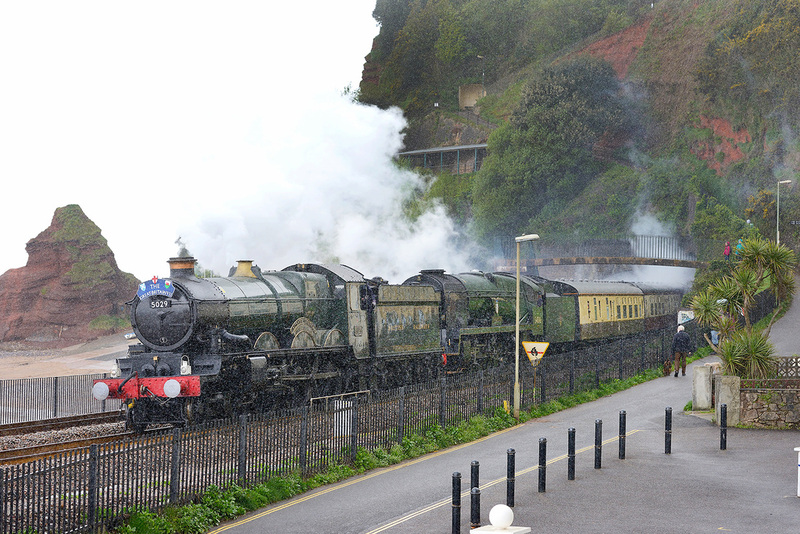 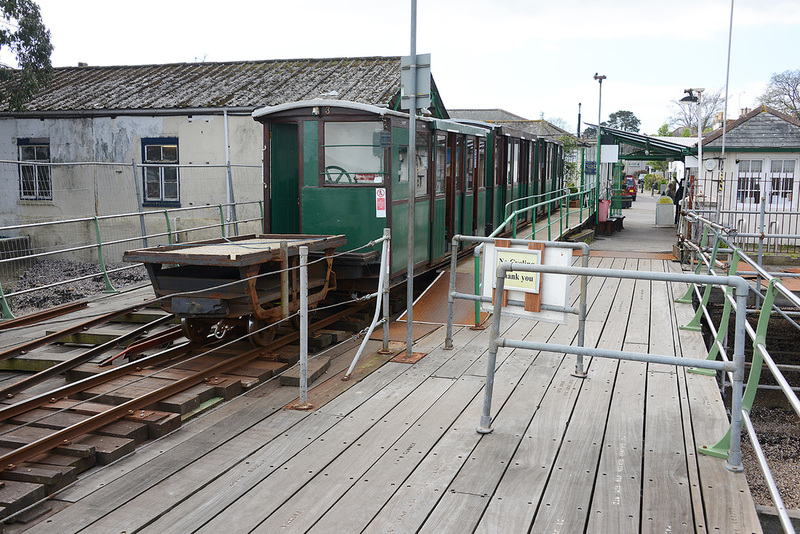 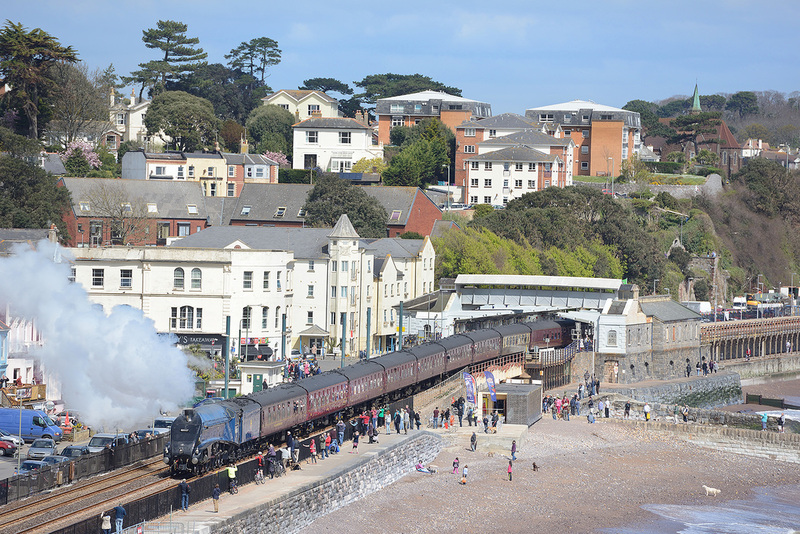 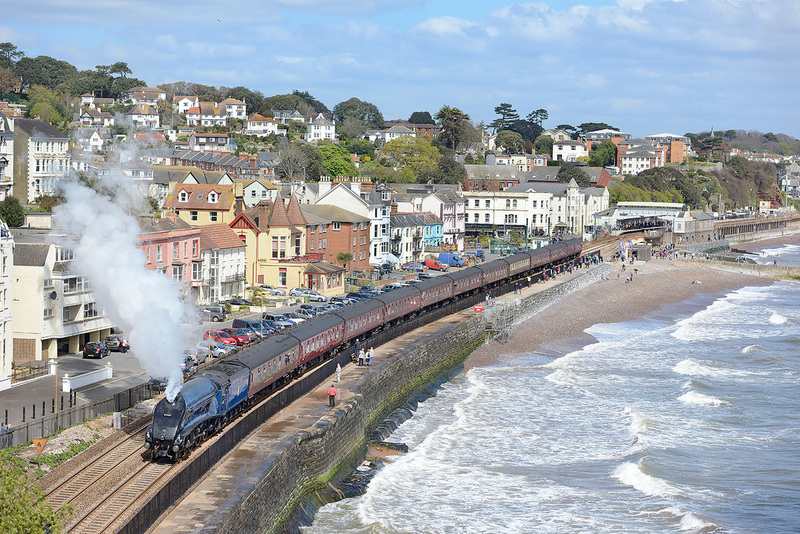 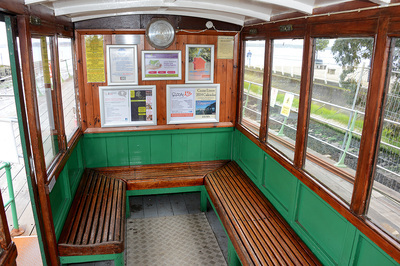 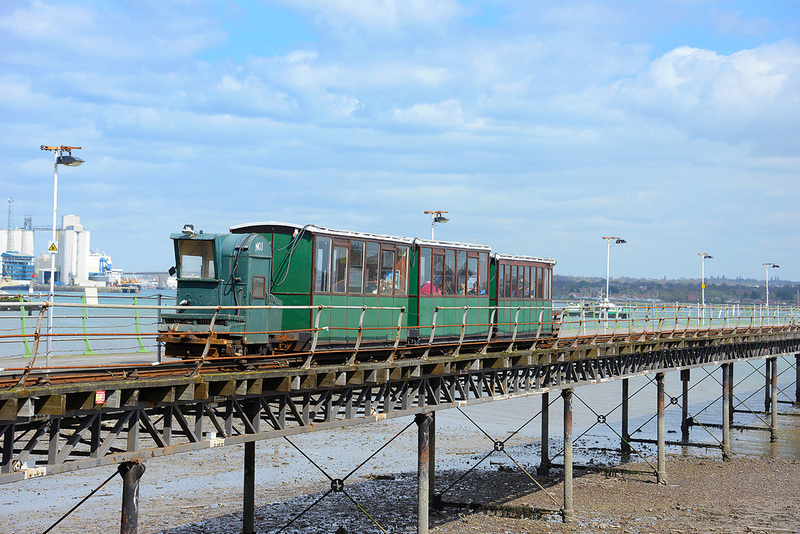 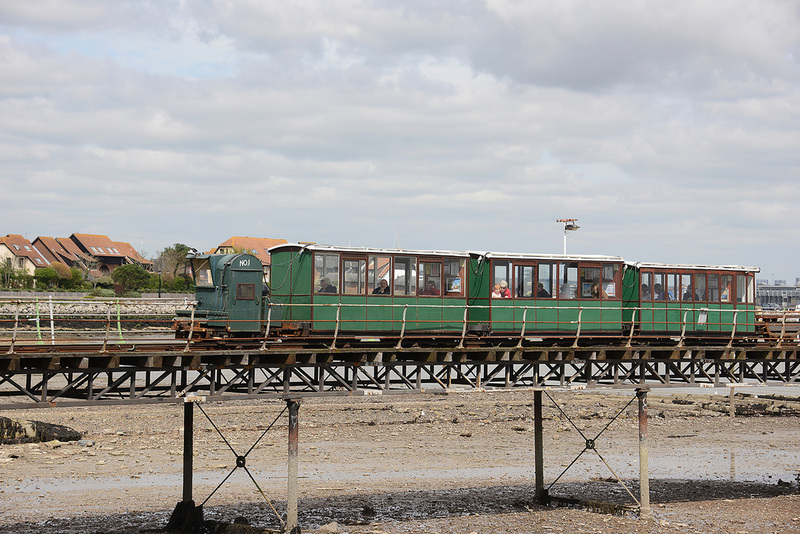 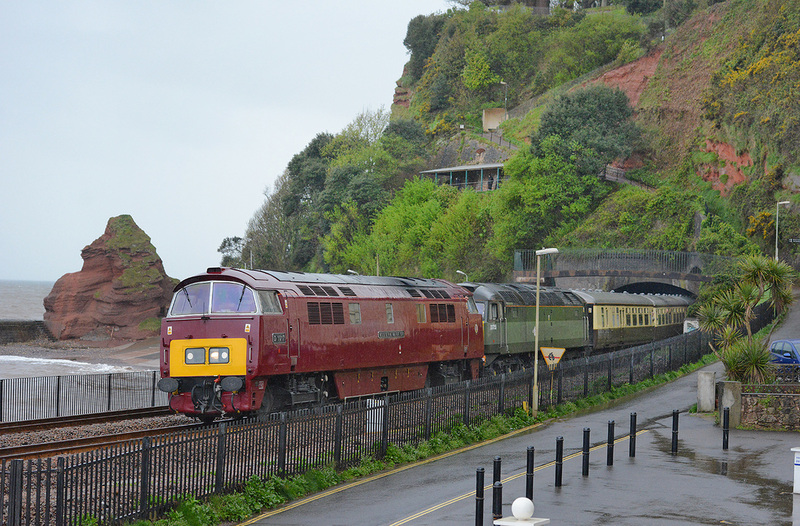 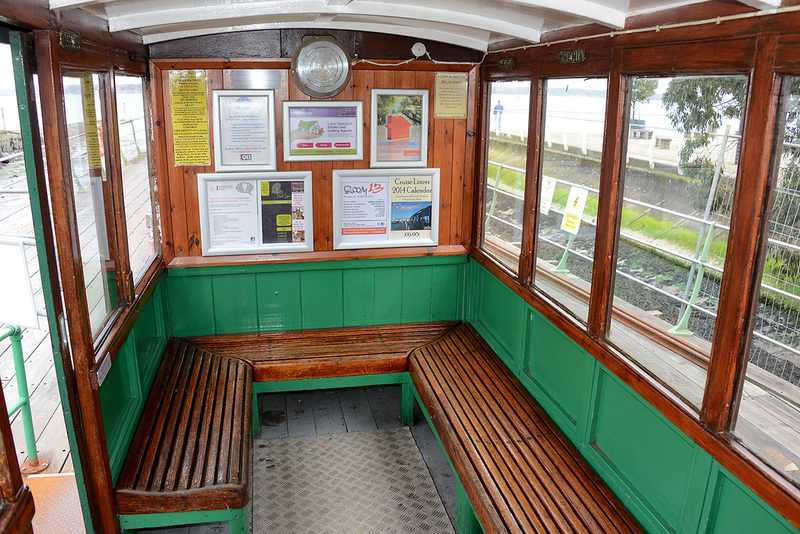 This was one of five trains operated from Westbury to the Dawlish Sea Wall in the early hours of 29 March 2014 as part of the final stage of restoring the line to passenger use from Friday 4 April 2014. 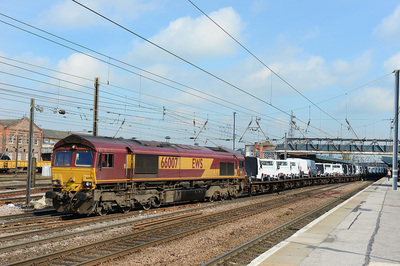 Power for these trains consisted of Freightliner Class 66s and two Colas Rail Freight Class 70s Nos. 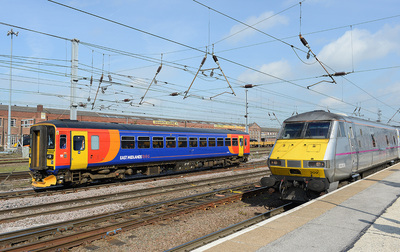 70801 and 70803. 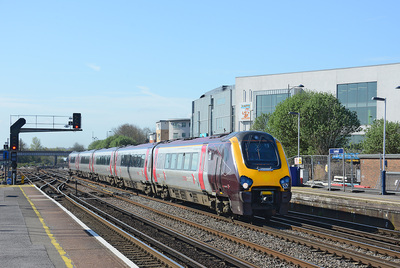 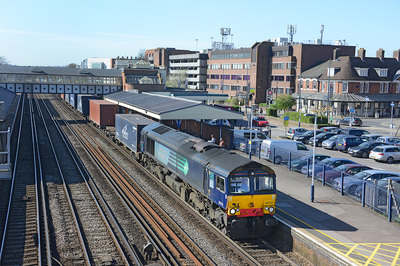 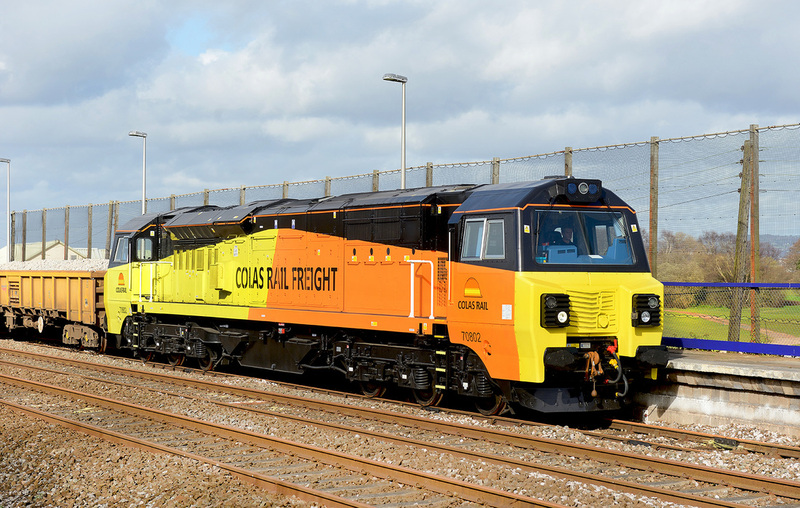 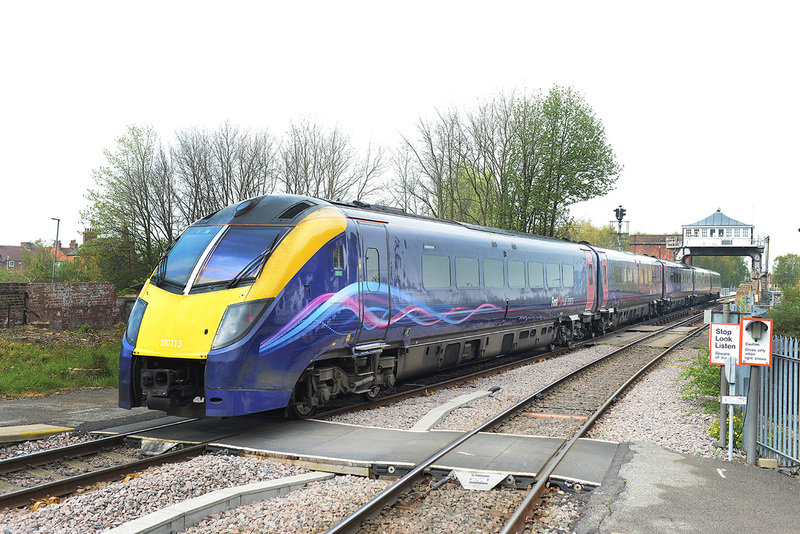 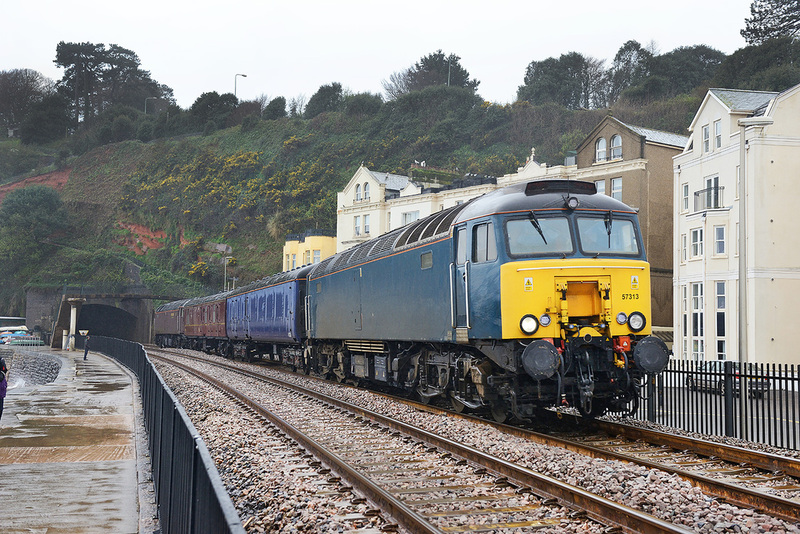 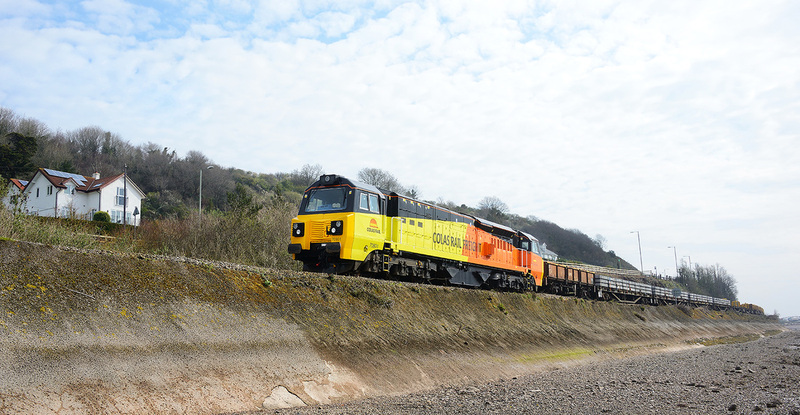 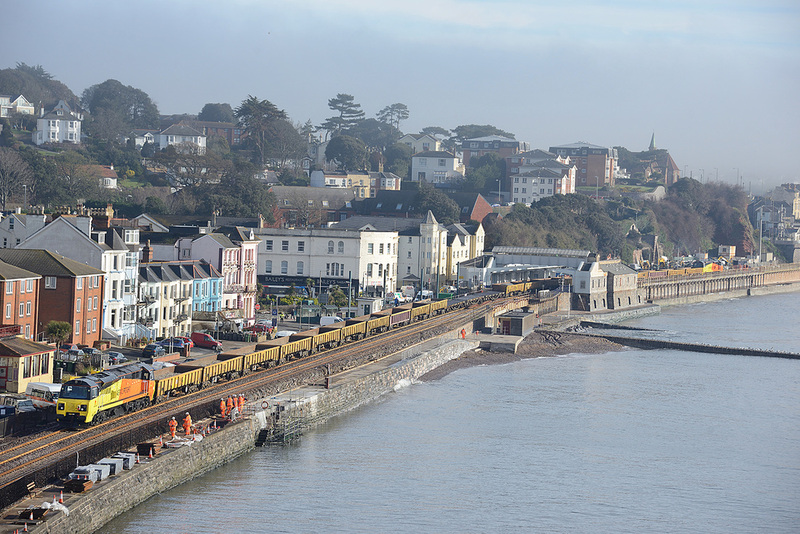 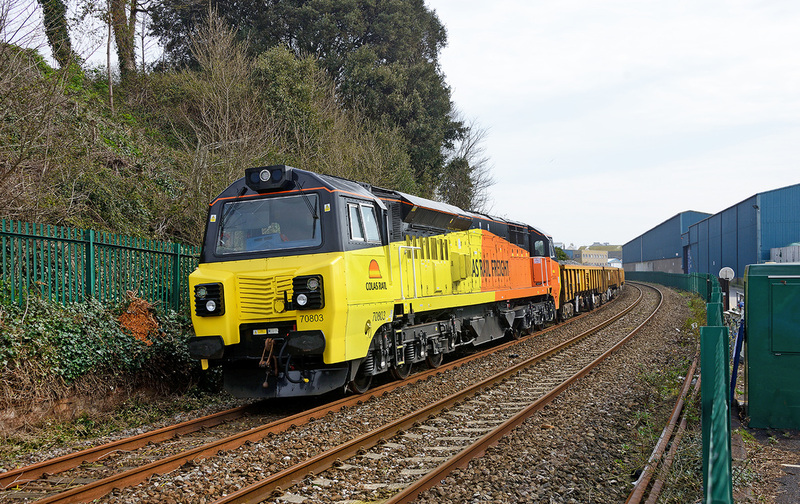 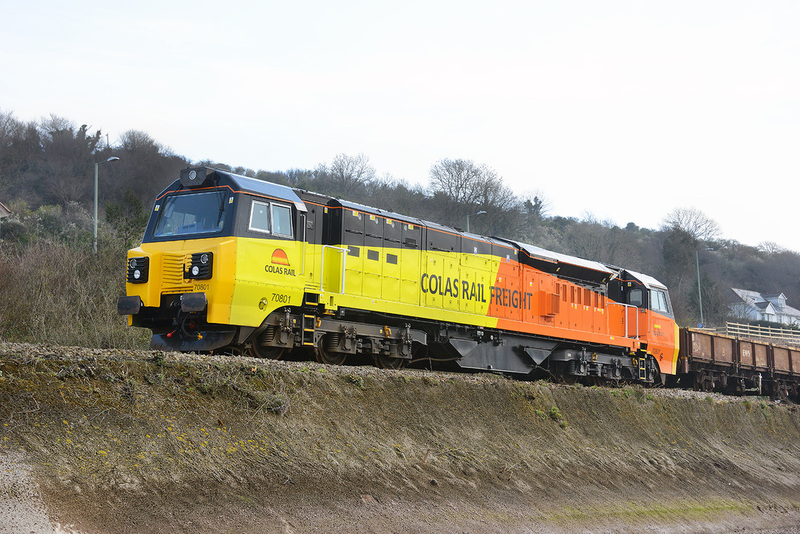 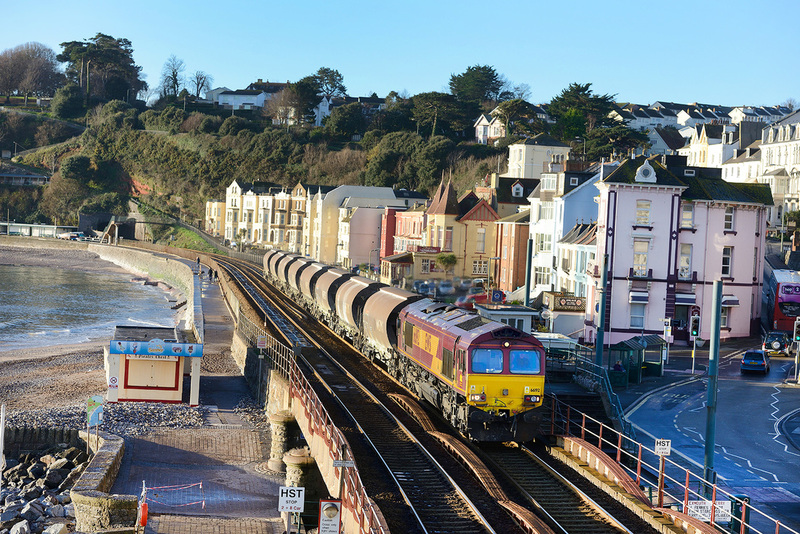 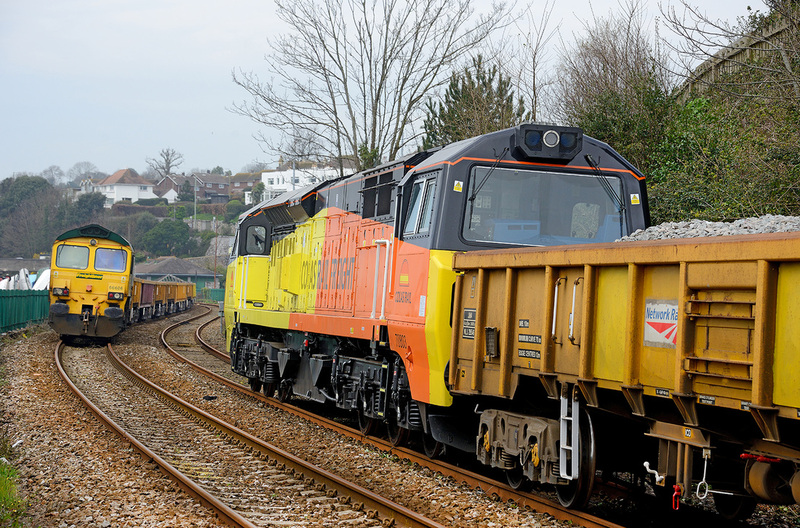 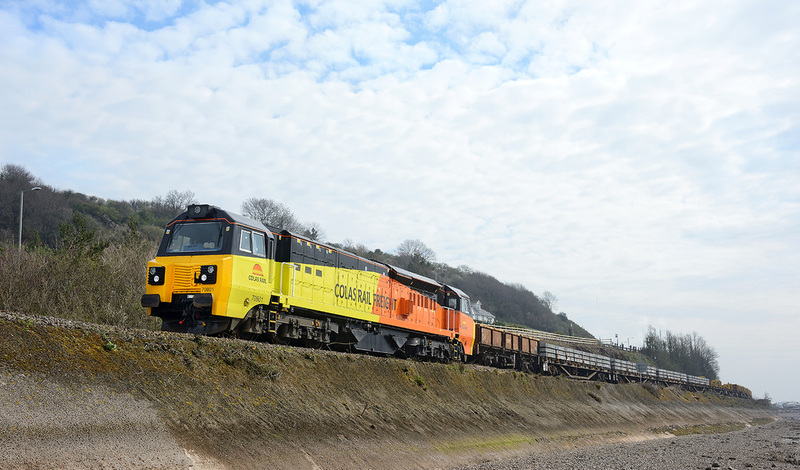 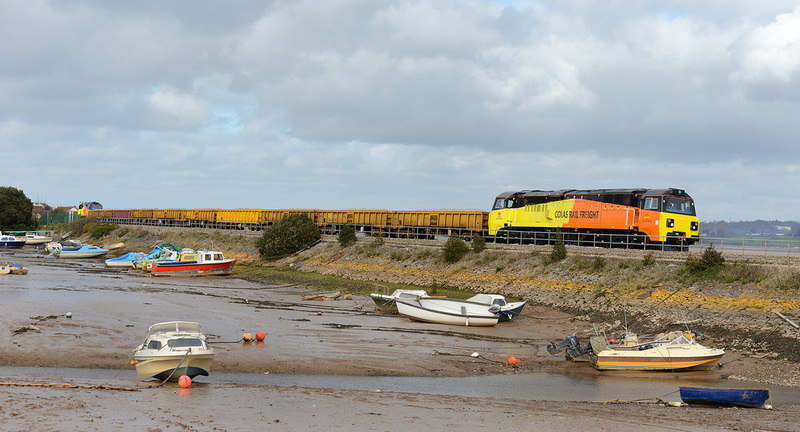 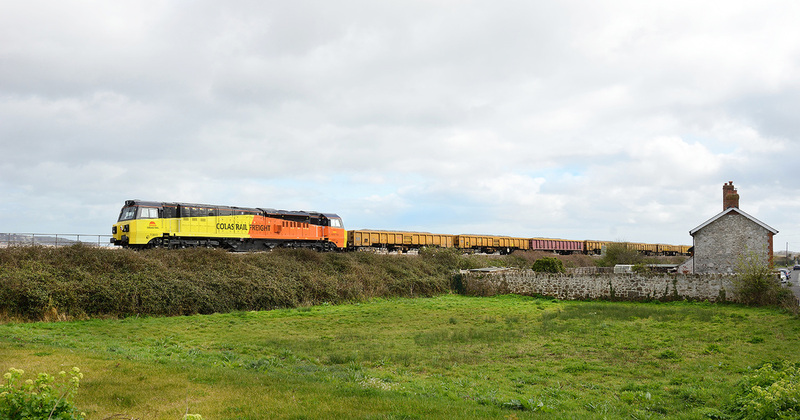 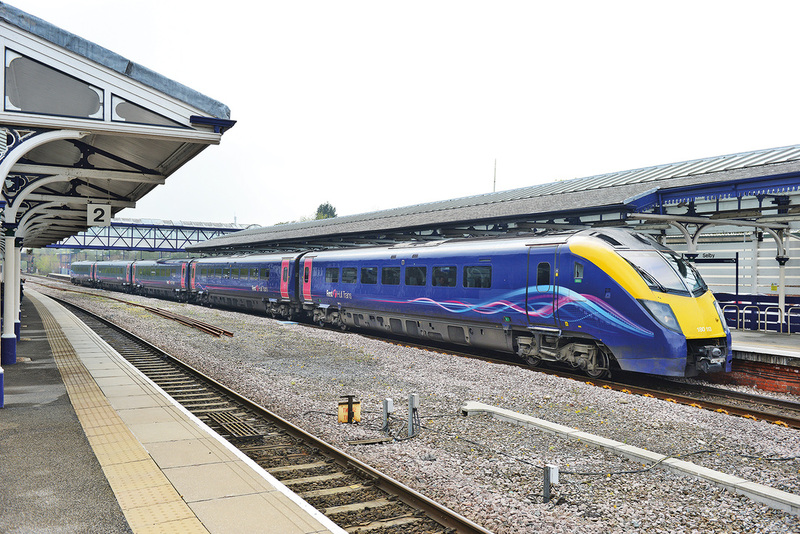 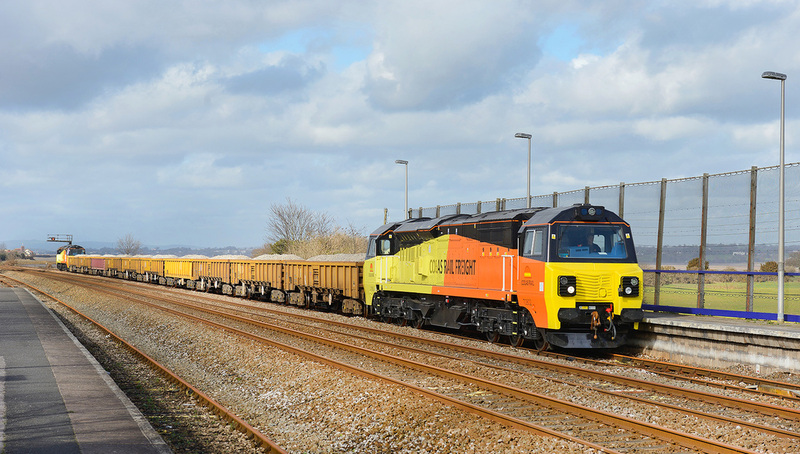 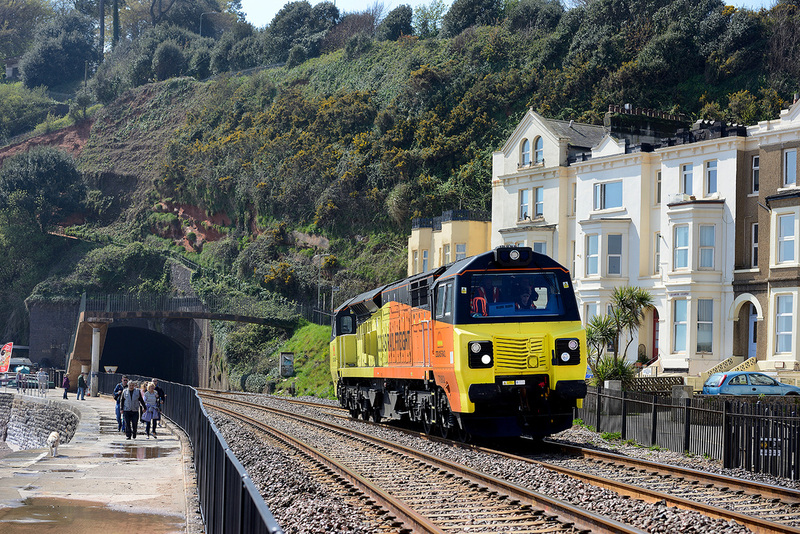 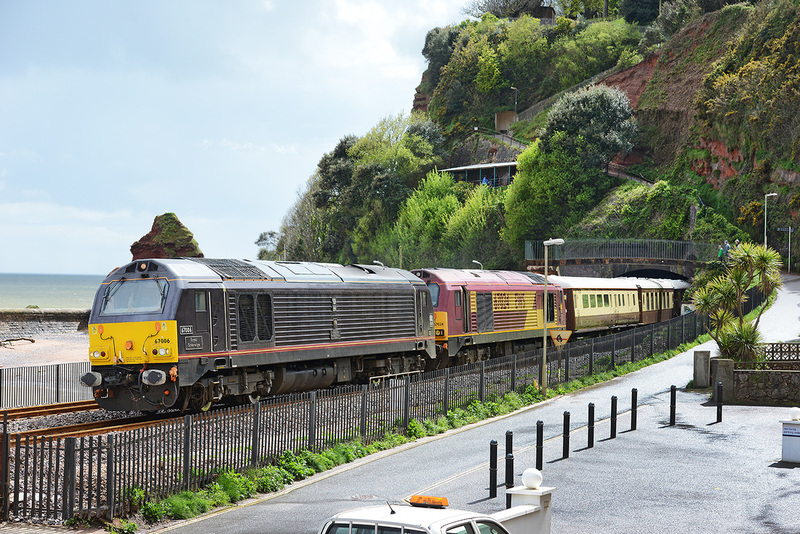 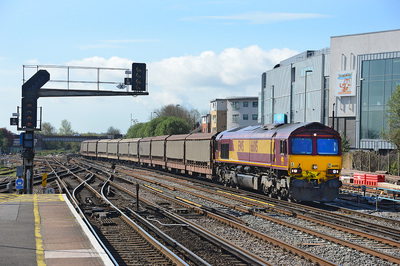 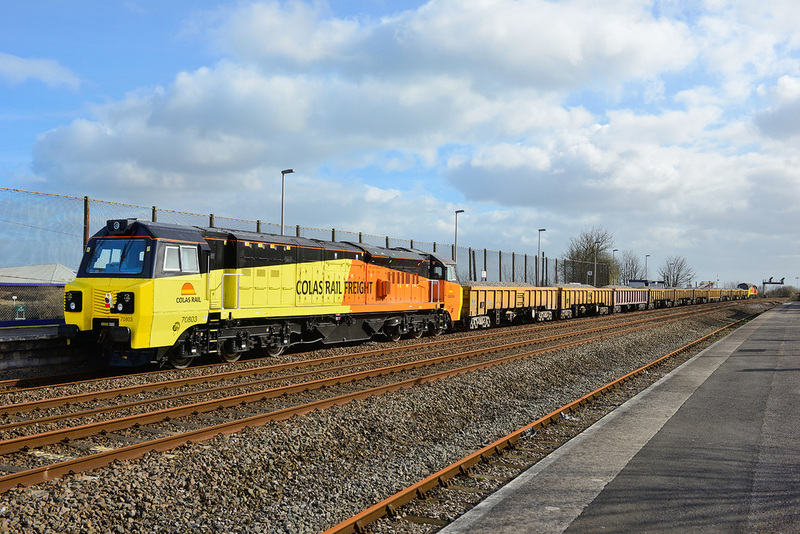 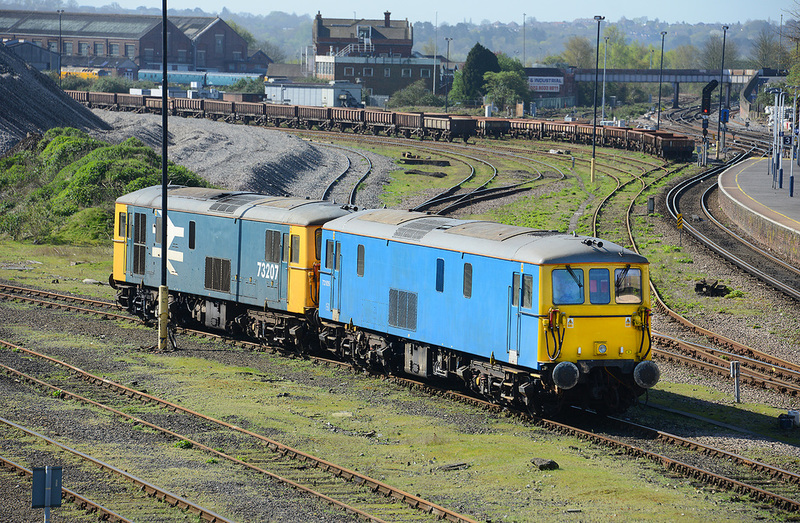 The first ever Class 70s to operate into Devon, and indeed the first 70 west of Taunton was on 18 March 2014 when in conjunction with the repairs to the Sea Wall between Dawlish Warren and Dawlish Colas Rail Freight were contracted to operate train 6Z70, the 11.20 Westbury to Exeter St Thomas (the entry to the engineering block). Here the train is seen at Easton with No. 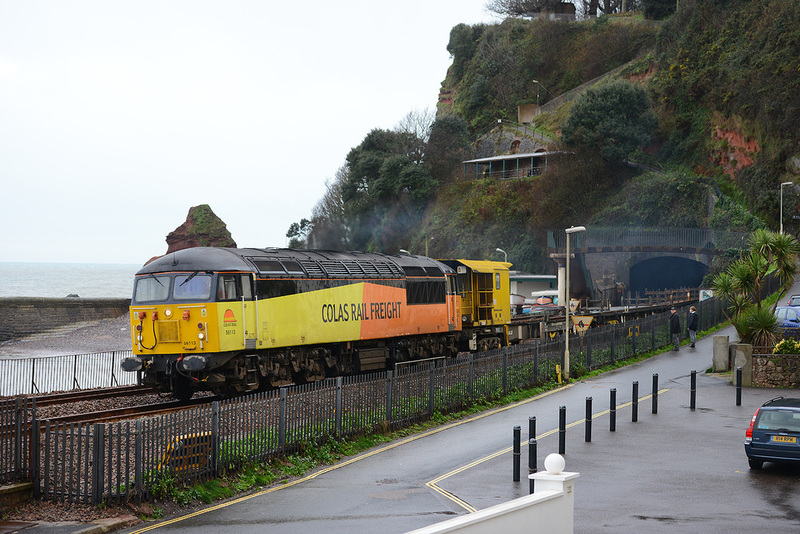 70803 on the rear. 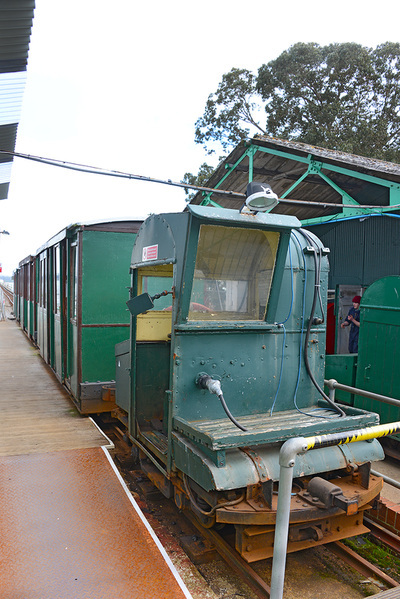 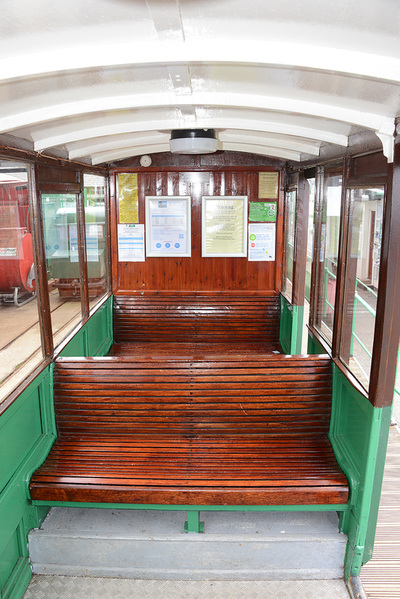 The train was formed of 10 ballast 'Falcon' wagons. 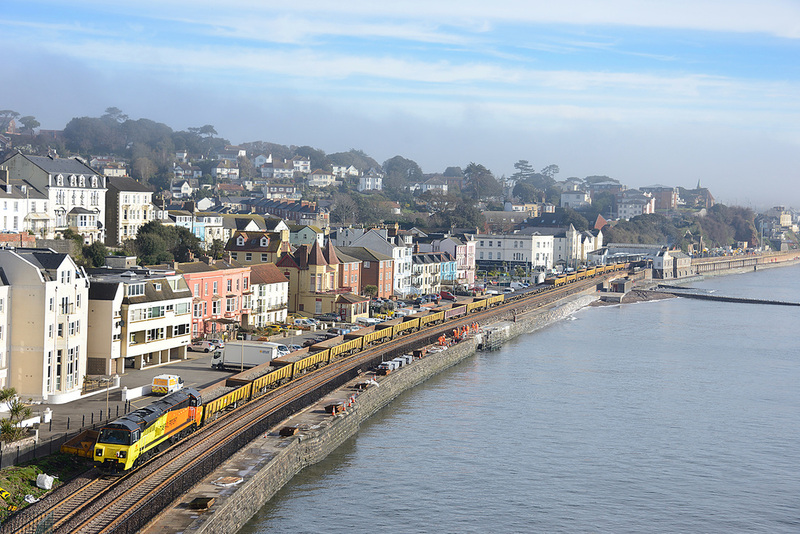 The first ever Class 70s to operate into Devon, and indeed the first 70 west of Taunton was on 18 March 2014 when in conjunction with the repairs to the Sea Wall between Dawlish Warren and Dawlish Colas Rail Freight were contracted to operate train 6Z70, the 11.20 Westbury to Exeter St Thomas (the entry to the engineering block). 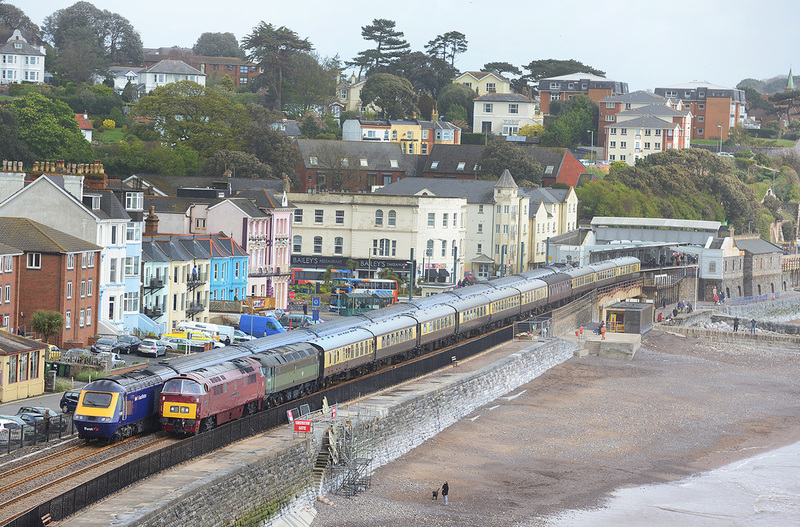 Here the train is seen at Dawlish Warren tailed by No. 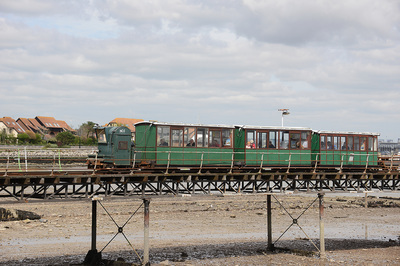 70803. 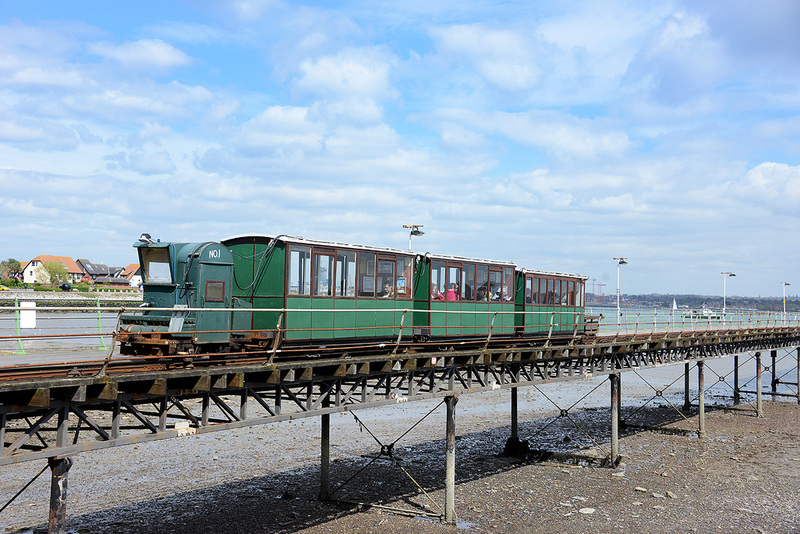 The train was formed of 10 ballast 'Falcon' wagons. 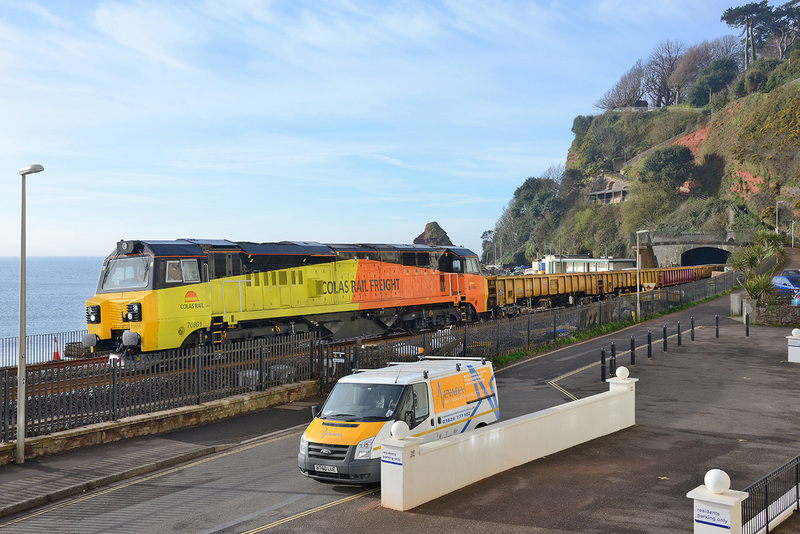 The first ever Class 70s to operate into Devon, and indeed the first 70 west of Taunton was on 18 March 2014 when in conjunction with the repairs to the Sea Wall between Dawlish Warren and Dawlish Colas Rail Freight were contracted to operate train 6Z70, the 11.20 Westbury to Exeter St Thomas (the entry to the engineering block). 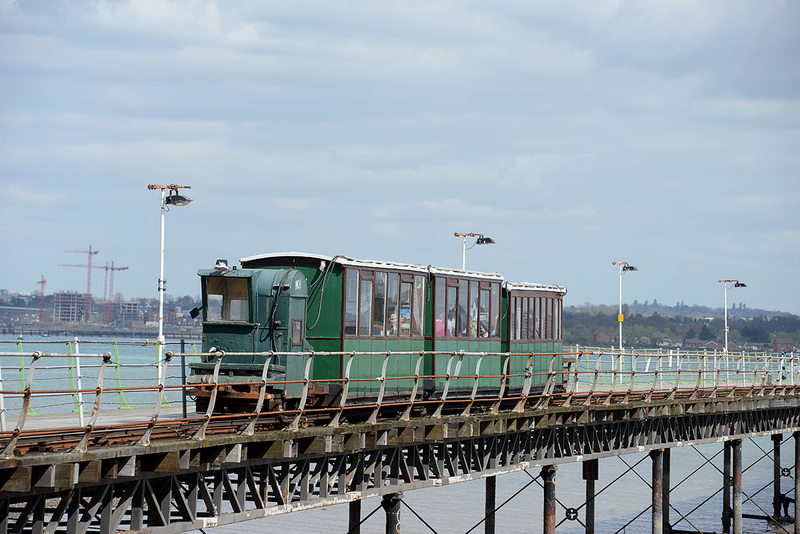 Here the train is seen at Dawlish Warren led by No. 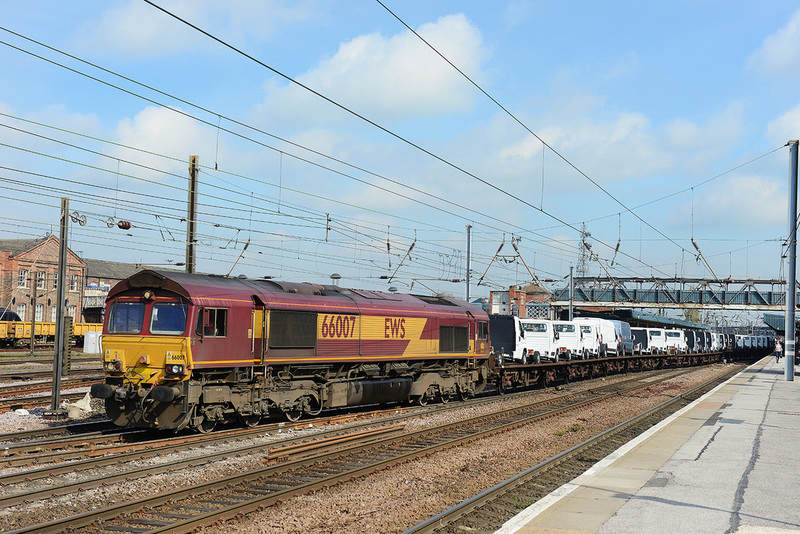 70802 and tailed by No. 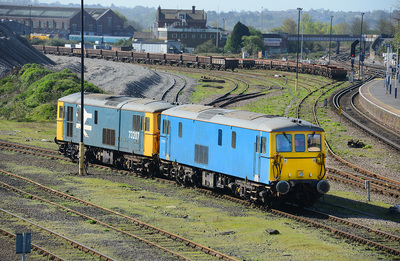 70803. 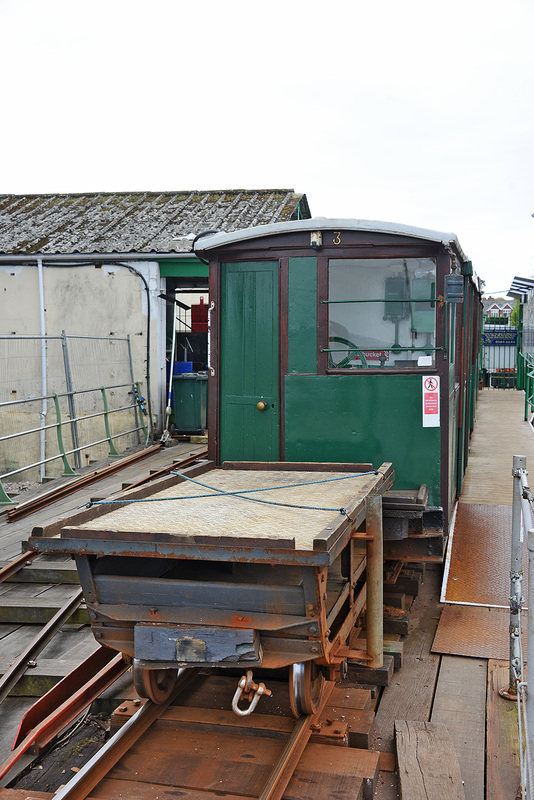 The train was formed of 10 ballast 'Falcon' wagons. 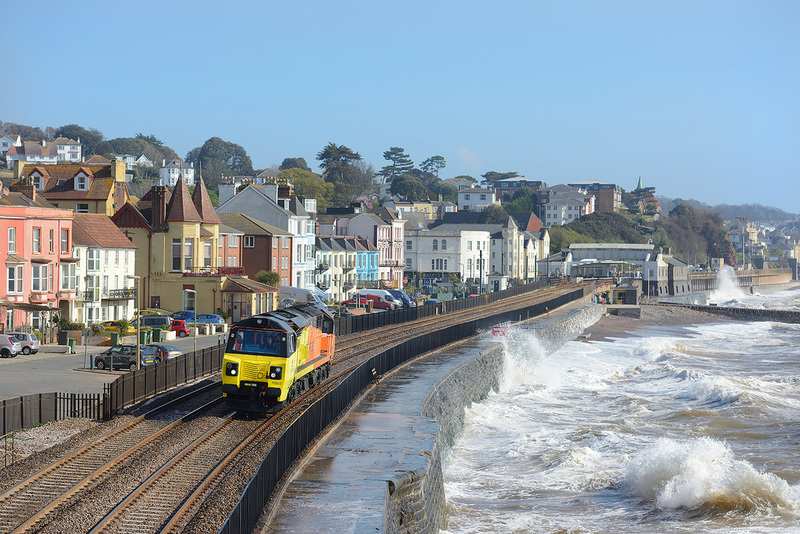 The first ever Class 70s to operate into Devon, and indeed the first 70 west of Taunton was on 18 March 2014 when in conjunction with the repairs to the Sea Wall between Dawlish Warren and Dawlish Colas Rail Freight were contracted to operate train 6Z70, the 11.20 Westbury to Exeter St Thomas (the entry to the engineering block). 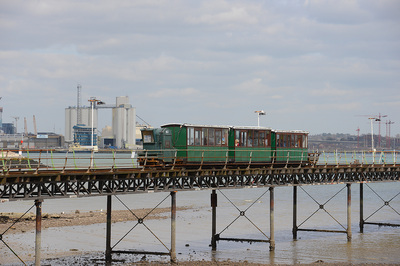 Here the train is seen near Cockwood harbour led by No. 70802 and tailed by No. 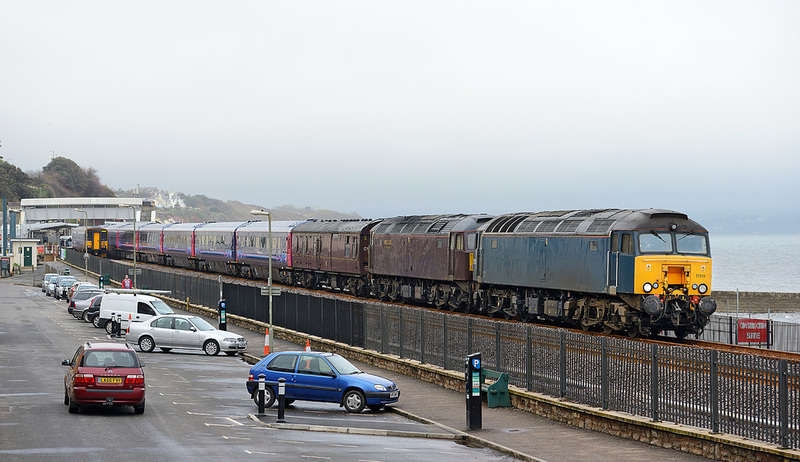 70803. 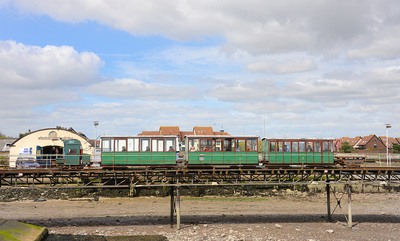 The train was formed of 10 ballast 'Falcon' wagons. 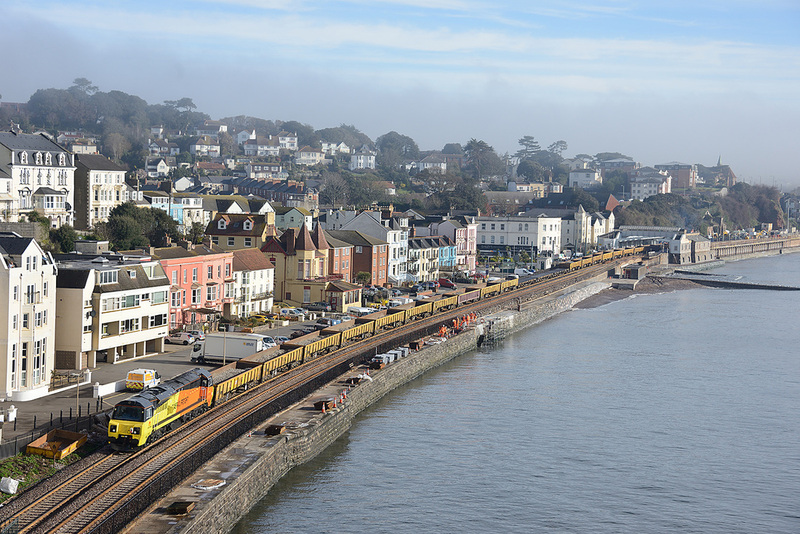 The first ever Class 70s to operate into Devon, and indeed the first 70 west of Taunton was on 18 March 2014 when in conjunction with the repairs to the Sea Wall between Dawlish Warren and Dawlish Colas Rail Freight were contracted to operate train 6Z70, the 11.20 Westbury to Exeter St Thomas (the entry to the engineering block). 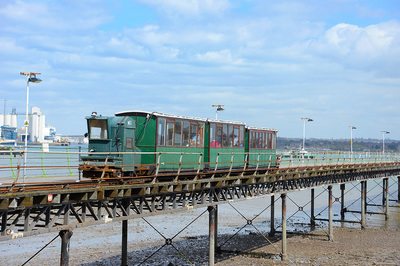 Here the train is seen crossing Cockwood harbour led by No. 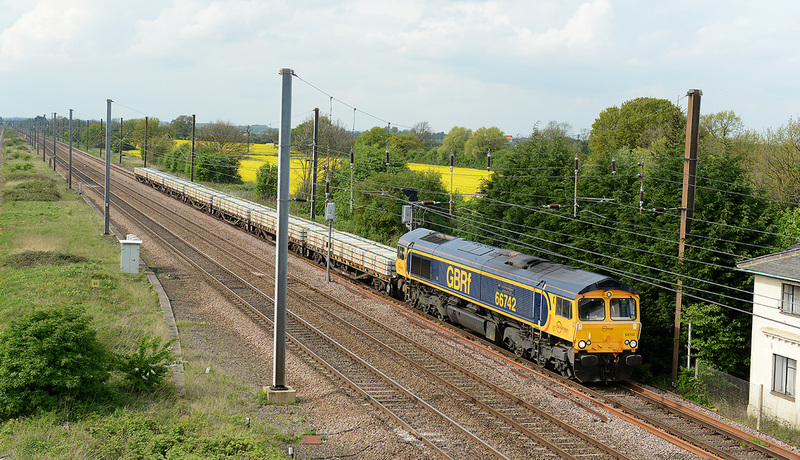 70802 and tailed by No. 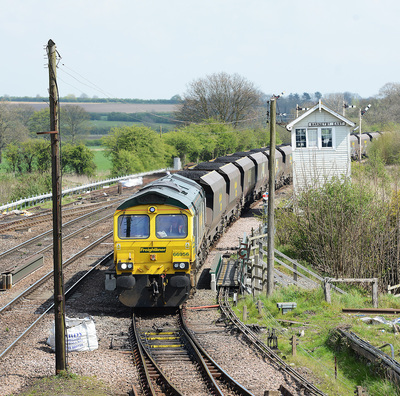 70803. 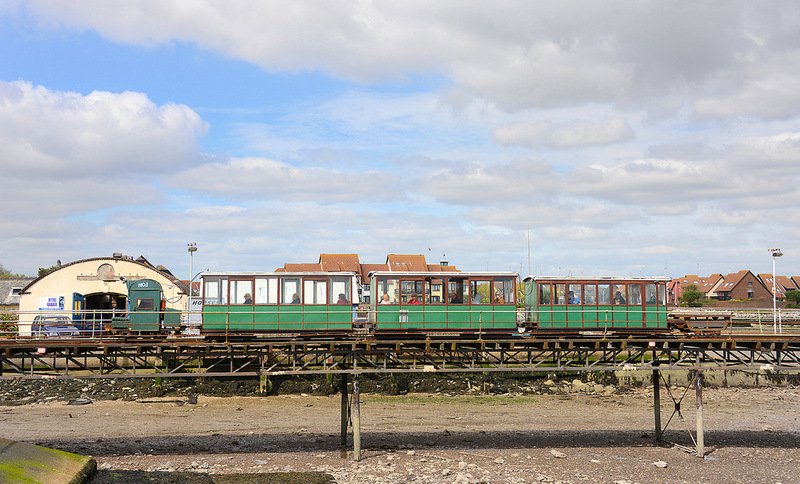 The train was formed of 10 ballast 'Falcon' wagons.